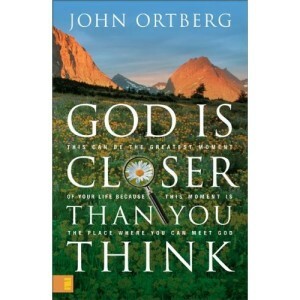 A study following the thoughts of John Ortberg, pastor and author, who encourage us in the belief that God is near and knowing him is possible for everyone who wants to feel his presence: “The teaching of Scripture is that God really is present right here, right now…. The Spirit of God is available to you and me: flowing all the time, welling up within us, quenching our unsatisfied desires, overflowing to refresh those around us.” Ortberg’s suggestions”to believe that God is in everything, to seek him in the daily and mundane, to learn to recognize and encourage God-inspired thoughts, to look for him in the people you meet and to obey his promptings, though not new, provide us with a series of ideas and activities to begin to change the way they see God in their lives. This entry was posted in Discipleship, Services on February 2, 2010 by Arkangel.